Former first minister taking legal action against Scottish Government over complaints. A lawyer acting for Alex Salmond told a court he will argue the former first minister was not given adequate information about the sexual assault allegations against him. 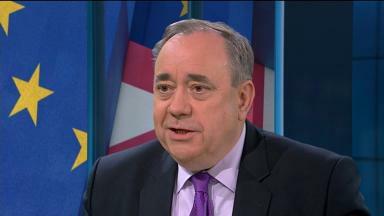 Mr Salmond is taking legal action against the Scottish Government to contest the complaints process activated against him in relation to two sexual harassment allegations made in January, which he strongly denies. He has since resigned from the SNP and is pursuing a judicial review in Scotland's highest civil court. A procedural hearing in the case took place at the Court of Session in Edinburgh on Tuesday, which he did not attend. Judge Lord Pentland said lawyers for the government would argue those acting for Mr Salmond do not "have a relevant case as a matter of law" but the latter believe they were not given adequate information about the allegations. Ronnie Clancy QC, representing Mr Salmond, said there should have been more information than the gist of the allegations and questioned the procedure under which they were investigated. Christine O'Neill, representing the Scottish Government, said it was made clear when Mr Salmond was told about the formal complaints in January "they were investigated in terms of the procedure". Lord Pentland told the court the Scottish Government's position is the First Minister agreed the complaints procedure on behalf of the government on December 20 and formal complaints were lodged on January 16 and January 24, 2018. Mr Clancy questioned if initial informal contact between those alleging sexual harassment and the government was made before the procedure came into force. Ms O'Neill said even if that was the case, it would not mean a formal complaint could not be lodged subsequently and argued the pre-formal complaint process is "essentially irrelevant". Mr Clancy said Mr Salmond was notified an initial investigation had been launched into the complaints on January 17, before one of the complaints appeared to have been formally lodged. Lord Pentland asked Ms O'Neill to make clear whether or not the earlier procedure was applied. The court also heard Mr Salmond had lodged a statement of written evidence, as had two other individuals - not named in court - for his case. The full case is due to be heard over four days from January 15 next year.